If you know me, (or have read my “About Me” page), you know that while I’m not currently practicing, I am a licenced teacher. An awesome perk of this, is being able to take advantage of various teacher discounts and sales, such as the one Chapters is hosting this weekend (30% off almost all regular priced items, plus bargain books; in store only). I purchased some items I’ve been eyeing for a while (and others that just happened to catch my eye while shopping)! Check them out below! I recently purchased a re-usable plastic drinking tumbler, and no sooner did I get it home, I dropped it off my counter. Luckily, the tumbler remained unscathed, but sadly, the straw inside smashed to pieces. However, my tears are dry, as I now have these awesome Kate Spade straws to use as replacements! The package comes with 6 straws in different colours, and each straw has a different saying on it: “Spike the punch”, “Laugh out loud”, “Dance til dawn”, “Strike a pose”, “Make it a double”, and “Life of the party”. They also have the Kate Spade logo on the bottom of each of them. They are 100% reusable, and are recommended “hand wash only”. Let’s be honest, drinking water is that much more appealing when it comes through a fun (designer) straw! This is one of the items I’ve been eyeing for a while; I just can’t seem to fathom that a pen could possibly last 7 years! The packaging states that the pen is able to write 1.7 meters a day for 7 years, thanks to its large ink cartridge and long-life tip. I felt the sale was the perfect time to test it out, and purchased the turquoise version that says “Notes to Self” on the clip. Provided I can avoid pen thieves (unlikely), I’m excited to write with this for many years to come! The other day, when forced to write on unlined printer paper, I realized I needed a new notebook. And, just as I have a love for graphic tees adorned with fun and inspiring quotes, I’ve now learned I also love them on notebooks, too. 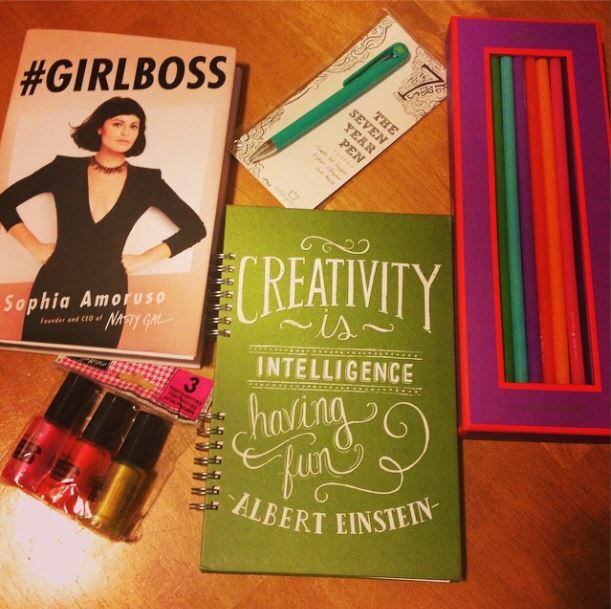 I’m especially fond of the quote on this spiral notebook, “Creativity is intelligence having fun” (Albert Einstein). It also works out perfectly that I now have a pen to fill up the blank pages (though sadly, I’m thinking the pen will likely outlive the notebook). At first sight, they look like small bottles of nail polish, but a closer look shows they’ll work perfectly for highlighting your favourite quotes in #GIRLBOSS (see it all coming together?). These are the ultimate girly desk-accessory (and, for $1.00, you can’t really go wrong!). Love all your purchases! GirlBoss is on my list of books to read too. Let me know how it is! Thank you 🙂 I’ll let you know how it is for sure! I’ve heard great things!